The analytic, on the other hand, strives for “universal scope, clarity and public accountability…. It tries to systematize knowledge” and approximate scientific methods of inquiry (which also once mixed freely with the theological). Both approaches can move too close to the poles Russell identifies—can move too far away, that is, from philosophy and toward the obscure and purely mystical or the inhumanely, unreflectively rational. Perhaps one way of thinking about the history of philosophy is as a dance between this play of opposites, with each approach offering a corrective to the other’s excesses, sometimes within the same thinker’s body of work. Carneades admits his biases and blind spots and welcomes corrections from those better versed in other traditions. To his credit, he includes Native American, African, Latin American, Afro-Caribbean, Polynesian, Japanese, Islamic, Tibetan, and many other global philosophical traditions in his extensive map—traditions that are usually completely ignored or deemed “unphilosophical” in other such surveys. His sensitivity to global thought may have something to do with the fact that he is not based in a Western academic department, but in West Africa, where he does humanitarian work. 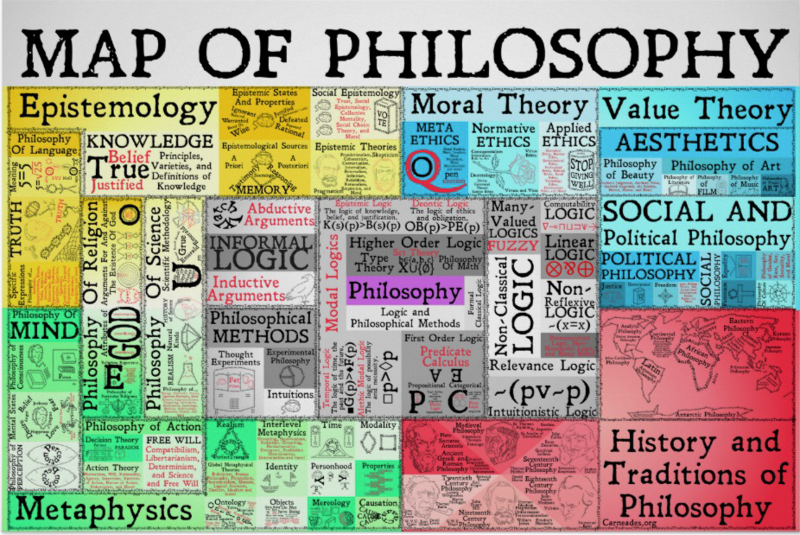 See a complete table of contents, with links to specific sections, for the lengthy "Map of Philosophy" just below, and an image of the full map just above (purchase a hard copy here). Carneades' intention to bring “these ideas back to the modern agora from the Ivory Tower” is a noble one. If you agree, and find these videos informative and intellectually stimulating, you can donate to or become a patron of his efforts at the Carneades.org Patreon page. I don’t hear Bertrand Russell at all. Far from it. All I can hear is this idiotic clown babbling on and on !